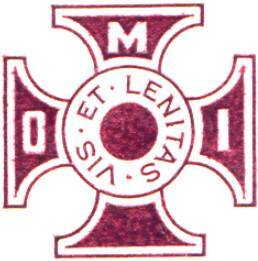 Ohio Military Institute was established in 1890, on the site of what had been Belmont College. 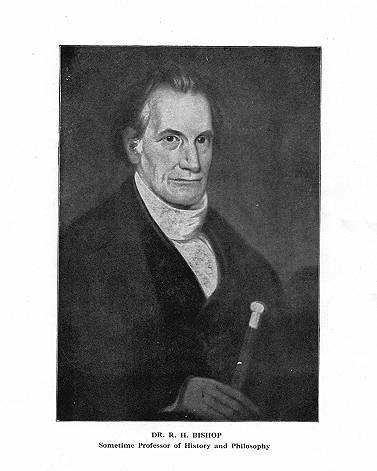 Freeman Carey, a graduate of Miami University at Oxford (Ohio) had established Carey Academy in his home on the family farm in 1832. It was a success, and within a few years, Carey built a small brick school building, apparently on the site of what later became Carey Hall. Carey Academy was "the leading private school west of the Alleghenies". 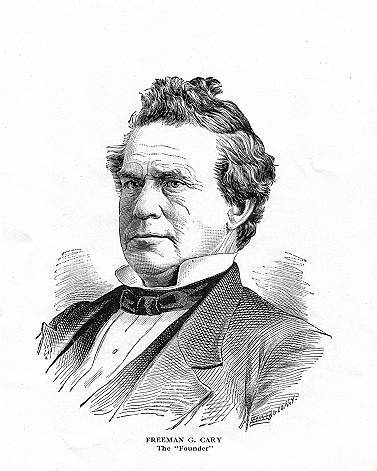 Dr. Robert H. Bishop, first president of Miami University, joined the faculty of Carey Academy during its final year in 1846. In 1847, the academy became Farmers' College, and it was at this time that Carey Hall was erected. This combination class-room building and dormitory would serve for the next 111 years. Dr. Bishop laid the cornerstone and stayed on to fill the chair of Philosophy and History in the faculty of the college. Shortly before his death in 1855 (at almost 80 years of age), he ask that his body and that of his wife "might find a final resting place on the College grounds." [Old Boys will remember the Bishop burial mound, which was located at the edge of the woods directly behind Henshaw Hall. This gymnasium/drill hall was built in 1949. When the school closed in 1958, the remains of Dr. and Mrs. Bishop were dis-interned and reburied on the grounds of Miami University. There was, it turned out, no truth to the rumor that Dr. Bishop's horse had also been buried with him!] Farmers' College claimed that "its distinctive feature [was] the practical character of its course of instruction.... to qualify our youth for a higher position in any of the industrial pursuits." (This vocational focus was markedly different from the "classical" model of higher education which prevailed at most colleges at this time. It was not until the late 1860's that the "land grant" colleges established by the U.S. congress would seek to equip its students for specific careers.) With the coming of the Civil War, fully two thirds of the student body rushed to enlist in the Union or Confederate forces. Farmers' College was forced to close, but not before it became a stop on the "underground railroad", assisting escaped slaves to migrate to the north. After the war the school re-opened as Belmont College, offering a curriculum more typical of the classical model of education. But Belmont debuted just as the land grant colleges were beginning to demonstrate that modern "vocational" education at the collegiate level was of more immediate utility in the dawning Industrial Age than was a classical education of philosophy, Greek, Latin, etc. With a shrinking student body, the school began to shift toward the education of younger men. In 1890, Belmont College closed, and the Ohio Military Institute opened on the same site in 1890. But the past was not completely abandoned: Portraits of Mr. Carey and Dr. Bishop hung on opposing walls of the main Study Room in Carey Hall until the buildings were torn down in 1958.
in the lower story of Bishop Hall - a dormitory(!). Not much is known now (circa 2000) of these early days at OMI. The original Old Boys have long since passed. We do know that Clarence B. Wood, the Commandant when he died, devoted 43 years of his life to OMI before passing away on 20 November 1950. Albert M. Henshaw, Superintendent, pre-deceased Wood, having passed away on 20 June 1950. Certainly his service to OMI was notable and, probably, as lengthy. 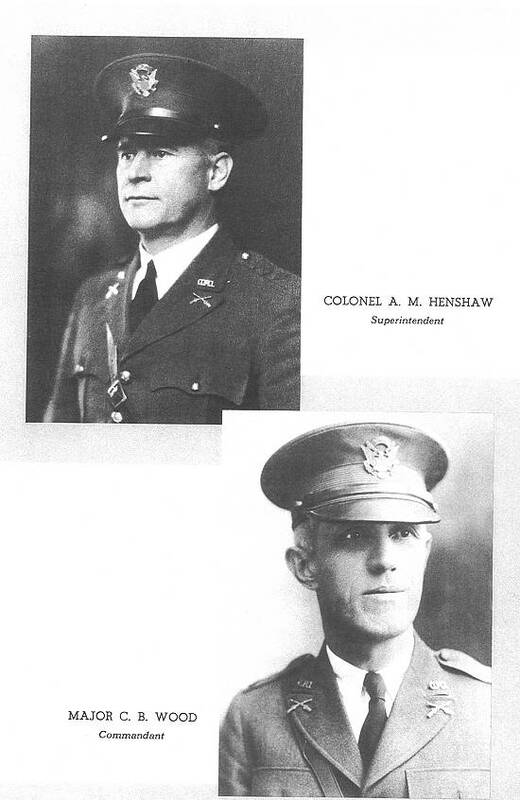 (In 1950, four of the nine school trustees still carried the name of Henshaw, and were almost-certainly related to Superintendent Henshaw, whose widow continued to live in the small house at the western end of the parade ground until, at least, 1954.) Other faculty members with long years of service at OMI included: Philip A. Andrus (1924-1958), C.A. Wile (1924-1951), Frank Thornton (1931-1958), Colonel Donald D. Davis, USAR (1936-1958), Harold D. Heard (1943-1958), and Captain F. Pete Derrick, USAFR (1928-1954). A school catalogue from 1950 described the grounds as "[N]ear enough [to Cincinnati] to enjoy all the educational advantages which only large populations centers ,,, afford, and yet it is far enough away to avoid any sinister influences," Originally, the grounds comprised about ten acres of woodland, fronting on Belmont Avenue and extending westward to a deep ravine. To this was later (date unknown) added a large tract of virgin forest land, nearly sixty acres in extent, surrounding the original property on three sides. This land had originally been part of the Carey farm and was acquired by that family from John Symmes, who secured the grant from the U.S. Government at the close of the Revolutionary War. In 1950 the school catalogue could still boast that "since that time these woods have not known the sound of the woodsman's ax. Many of the original trees, hundreds of years old, are still standing." Harrison Hall (the old Daller House), which was used as a dormitory and recreation building for Lower School cadets, was acquired sometime in the late 1940's, and yet another four acres to the campus. The school buildings included Carey, Belmont, Bishop, Perry, Henshaw and Harrison Halls. Of these, only Henshaw Hall remains and it is apparently still used as a community center for basketball. The other school buildings were razed to make way for Aiken High School, which opened in 1961. Below are pictures of Cary Academy Founder, Freeman G. Cary; Farmers College Chairman of Philosophy and History, Dr. Robert H. Bishop; Ohio Military Institute Superintendent, Colonel A. M. Henshaw, and Commandant, Major C. B. Wood, followed by an article about the closing of Ohio Military Institute that appeared in the "Cincinnati Enquirer" on June 10, 1958. "High Costs Bring OMI End"
"High School Plans Are In The Making"
"Military Institute With 126 Year History Is Victim Of Inflation"
circumvent the ever increasing spiral of inflation affecting us all." repairs, services and salaries rising faster than the ability of the school to adjust it's modest tuition equitably, and a financial loss from current operations again apparent, closure becomes an economic necessity, the trustees statement said." The board promised parents of cadets it would help them place their sons in other military schools if they desired. the school's new armory-gym and athletic field will be kept for the new high school. according to Joseph Beckman, administrative assistant to the superintendent of the Cincinnati school board. until the 1961/2 term, he added. The new school may be named for Albert Melville Henshaw, who was OMI superintendent from 1906 until his death in 1950. One of the sale terms was that the school board "give serious consideration" to honoring Henshaw in this way. The board also agreed to microfilm and store records of the OMI students and to preserve and display certain mementos from the school's past. The 30 OMI employees, including 12 faculty members, were notified yesterday of the sale. Some will be retained for an inventory, Birch said. underground railroad, and fugitive slaves were hidden in the cellar and attic of Cary Hall. When girls were admitted after the Civil War, the name was changed to Belmont College. In 1890 it again became an all-boys school. Military courses were added and the present name was adopted.